alaTest has collected and analyzed 3 reviews of Panasonic HC-V700M. The average rating for this product is 4.2/5, compared to an average rating of 4.1/5 for other Camcorders for all reviews. People are impressed by the usability and price. The connectivity and portability are also mentioned favorably, whereas some have doubts about the color and battery. We analyzed user and expert ratings, product age and more factors. 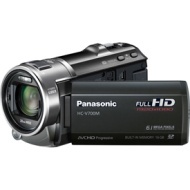 Compared to other Camcorders the Panasonic HC-V700M is awarded an overall alaScore™ of 86/100 = Very good quality. The Panasonic HC-V700M lacks some of the useful Wi-Fi features found on competing consumer camcorders, but excellent video quality in a variety of lighting scenarios more than makes up for it. Panasonic didn't get everything right with this model, but I found this camcorder generally easy to use. It shoots exceptional video, and comes with a lot of well-implemented extras.